We are a friendly small monastery of the Thai forest tradition under the auspices of T.A. 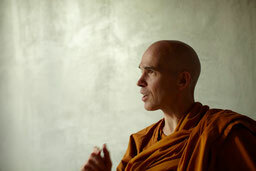 Jayasaro (the former abbot of Wat Pah Nana chat, the international training monastery of Ajahn Cha in Thailand). Our main focus is to make the most original instruction of the Buddha accessible to practitioners. In addition to (optional 8 Precept-) practice days on Saturdays from 11-21 hours and a meditation meeting Wednesdays from 18-20:30 hours, we also provide a systematic introduction to the world of ideas of the Buddha on the basis of the Pali Canon. Our programs include guided meditations and lecture series, as well as training programs spanning several years. Our programs seek to integrate meditation practice, character formation and study of scripture to facilitate a holistic development in the spirit of original Buddhism. In addition, we are friends with other monasteries and monks have occasionally interesting monks and nuns from different traditions as a guest. Our resident monk is Ajahn Piyadhammo. Born in Berlin, he has initially been trained in Wat Pah Nana Chat. Afterwards he lived for many years in monasteries of Asia and North America. All events take place on a donation basis.